As soon as I finished my Double Four Patch top I started a new baby quilt. How pleasant it is to work on a quick and simple project! Last week my third grandson was born and I am going to visit my son's family in London next November and bring the quilt with me. To start this quilt I have been waiting to learn wether the baby would be a boy or a girl, as I wanted to make one really boyish or girlish. Thus the project had to be very quickly done. 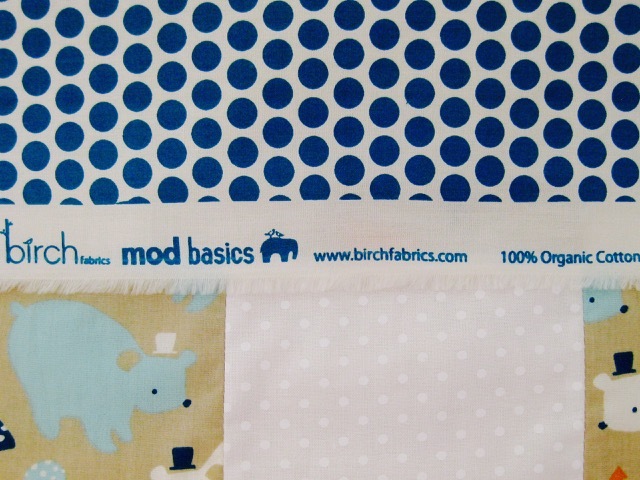 I chose printed organic fabrics with blue and white bears and a dotty blue and white fabric for the backing. The batting is 100% wool. 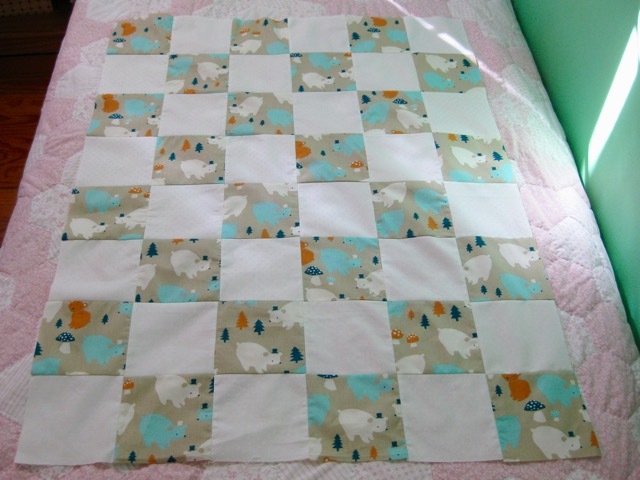 For the quilting beginners I am preparing a tutorial for this baby quilt from A to Z, with all the measurements. Félicitations aux heureux parents et grands-parents !! 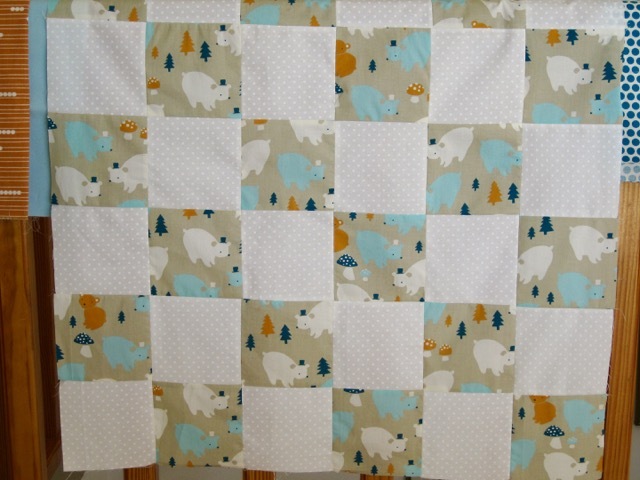 So sweet the ice_bears in the wood (forrest) baby quilt ! So cute! Congratulations! Grandchildren are a wonderful gift! Congratulation on your new grandson! Such cute bears and I like the dots you choose to balance them. Have you works with wool batting before? It's my favorite. Such great loft and super cozy. This will be a well loved quilt for sure. It's wonderful. Sometimes simplicity is the best. Surely he will love those bears with hats, and think of his loving grandmother. Have a fun visit! Quel joli modèle !!! Les tissus sont ravissants . Merci pour le futur tuto . Je n'ai jamais fait de patch à la ma chine , ce sera peut- être le début . Belle soirée . 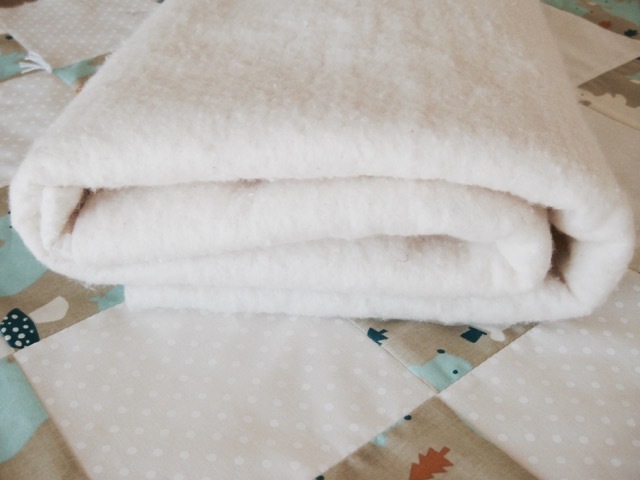 So simple and sweet and really perfect for a baby quilt. Bienvenue à ce troisième petit-fils! J'aime beaucoup cette simplicité qui met en valeur ce tissu absolument adorable. Bon quilting! Congratulations on your new grandson! 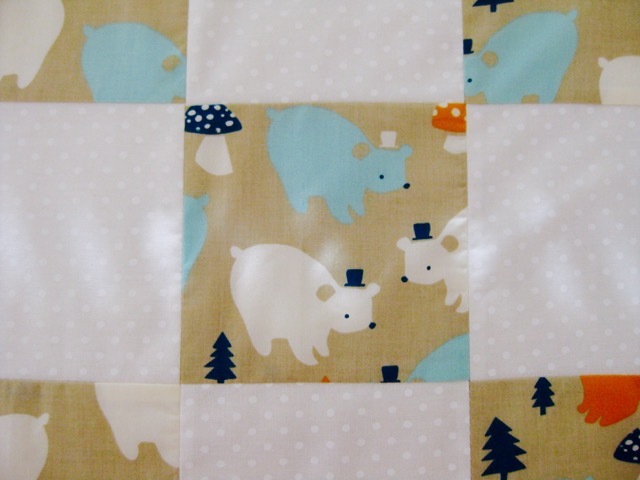 I love your fabric choices for the baby quilt! Oh quelle bonne nouvelle, je ne savais pas que tu allais avoir un troisieme petit bébé, félicitations aux parents, je vois que cela te motive pour faire des mini plaid, il est magnifique ! Congratulations! 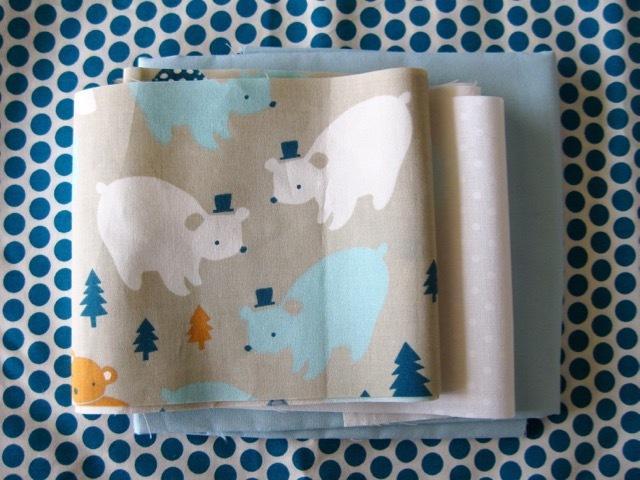 That grandson will love those cute bears with hats :0) Great fabrics! What wonderful news, Christine! Congratulations! Your grandson will be the envy of all with this fab quilt.